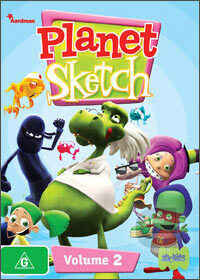 Planet Sketch is a kids television series aimed at (I assume) under 10s. Each ten minute episode consists of mercifully short sketches featuring various characters such as the Dragon doctor who unsuccessfully tries to eat his patients and Japanese Fighting Fish who speak with an hilarious mixture of English accents. The computer generated animation is a creation of Aaardman studios. With this impressive pedigree, it’s even more disappointing that the animation is bland and simplistic; much of it looks like something you’d find in a flash animation on the net. Still, there are some clever characters and the humour, though juvenile is occasionally quite clever. The gags with the flatulent horses are, however, not in that category. But far be it from me to be a grumpy old man, this show will most likely please its intended audience. Each episode offers variations of the same gag - great when you watch one each week but not so much when you watch seven of them in a row. Planet Sketch is a decent children's show, but it really deserved better animation. Not that the kids will mind.